Embedding has now become the norm when it comes to sharing content on websites. In WordPress, embedding content from sites like Youtube, Twitter, and SoundCloud is downright easy, thanks to the oEmbed API. Simply add the link into the post content and, WordPress immediately parses the link and renders it into a presentable format. But, what do you think of the idea to embed a WordPress post, in a way similar to how we would embed a Tweet or a Youtube video? Allowing readers to embed your post would certainly increase your site engagement and viewership coming from other websites. This genuine idea is under discussion, in the WordPress development group, to be added into the WordPress Core functionality in the future. But as of now, we can apply it into our blog with the help of a plugin called oEmbed API. First of all, this plugin requires at least WordPress 4.3 so ensure that your website has been updated. Install the oEmbed API plugin. The site must be accessible online, otherwise the embed could fail. The embedded content is nicely laid out. It shows the post title, the excerpt, the site name, the number of comments, and the Share button which will display the post permalink for embedding the content. And that is essentially all you have to do. If you are fine with the default output you can stop here. But if you want more customization options, here are a couple of things you can do. 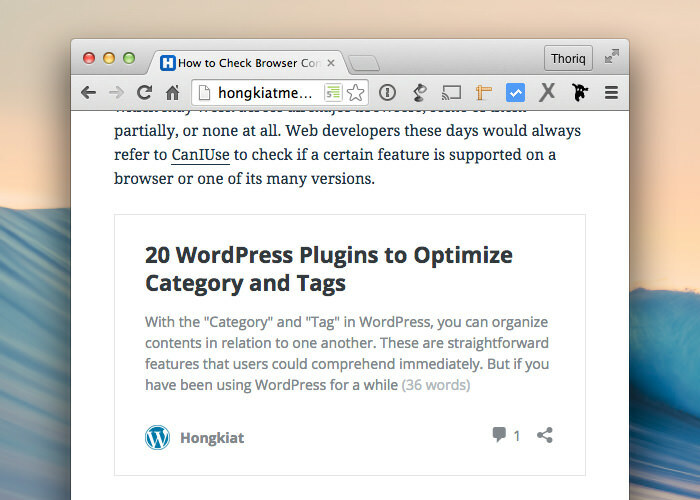 One of the reasons this plugin requires the latest WordPress version is the Favicon. The ability to add favicon natively through the dashboard has only been introduced in 4.3. but this also means that your embedded content will be displayed with the WordPress icon inline with your site name. For us, this seems irrelevant since the content comes from our site, not WordPress icon. We’d like to see our site logo inline with our site name instead. To do this, we go to the Appearance > Customize > Site Identity tab. Yet, it provides a rest_oembed_output action that we can leverage for adding new content as part of the final output, including an inline style. It isn’t ideal, but at the very least, it lets you override the styles of the embedded content. The following is an example of a code that you could add into your theme functions.php to turn the font to serif type. Just change the return number, as needed. You can follow the development progress in the Github issue tickets as well as in the WordPress Dev thread. All in all, this will be a great addition for WordPress.